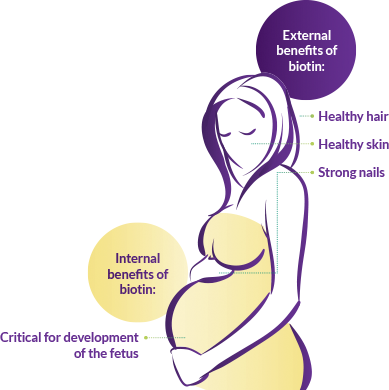 Research suggests that between 1/3 and 1/2 of women develop biotin deficiency during pregnancy, and can be positively impacted through oral supplementation.8 Biotin is a vitamin important for cellular function and growth and therefore is essential to fetal development.11 Biotin is also important in maintaining healthy skin and nails. Biotin is not naturally produced in the body, so it is suggested pregnant women look for a prenatal supplement that includes biotin, such as PrimaCare™, to provide these key benefits. References: 1. Primacare™ prescribing information, Avion Pharmaceuticals, October 2016. 2. Prenate Mini® Prescribing Information, Avion Pharmaceuticals, January 2015. 3. Citranatal Harmony® Prescribing Information, Mission Pharmacal, November 2016. 4. Citranatal Assure® Prescribing information, Mission Pharmacal, November 2016. 5. Citranatal® 90 DHA Prescribing information, Mission Pharmacal, November 2016. 6. Vitafol® Ultra Prescribing Information, Exeltis Pharmaceuticals, March 2015. 7. Concept DHA Prescribing Information, US Pharmaceutical Corporation, March 2017. 8. Prescott SL, Wickens K, Westcott L, et al. Supplementation with Lactobacillus rhamnosus or Bifidobacterium lactic probiotics in pregnancy increases cord blood interferonc and breast milk transforming growth factor-b and immunoglobin A detection. Clin Exp Allergy. 2008; 38:1606–1614. 9. Zempleni J, Mock DM. Marginal biotin deficiency is teratogenic. Proc Soc Exp Biol Med. 2000;223(1):14-21 10. Mock DM, Quirk JG, Mock NI. Marginal biotin deficiency during normal pregnancy. Am J Clin Nutr. 2002;75(2):295-299 11. Mantagos S., Malamitsi- Puchner A, Antsaklis A, et al. Biotin Plasma Levels of the Human Fetus. 12. NCBI Website. Treatment of brittle fingernails with biotin. Floersheim GL; Z Hautkr. 1989 Jan 15;64(1):41-8. https://www.ncbi.nlm.nih.gov/pubmed/2648686. Accessed April 21, 2017. 13. Colombo VE, et al; J Am Acad Dermatol. 1990 Dec;23(6 Pt 1):1127-32.